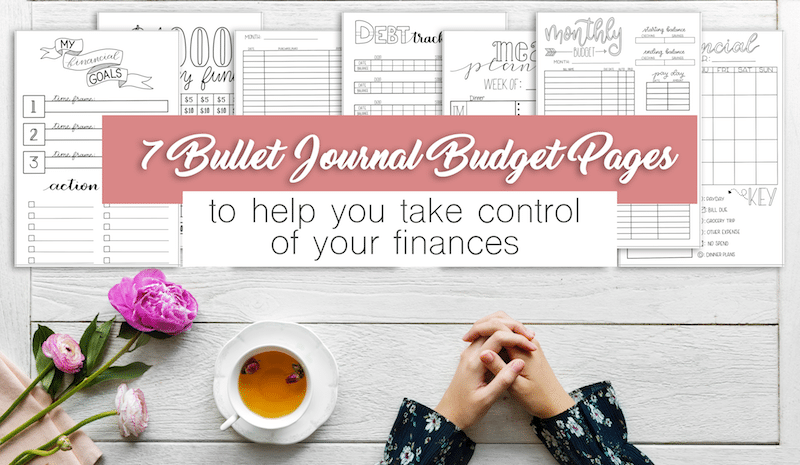 Check out these top tips and bullet journal budget printables to take control of your finances. 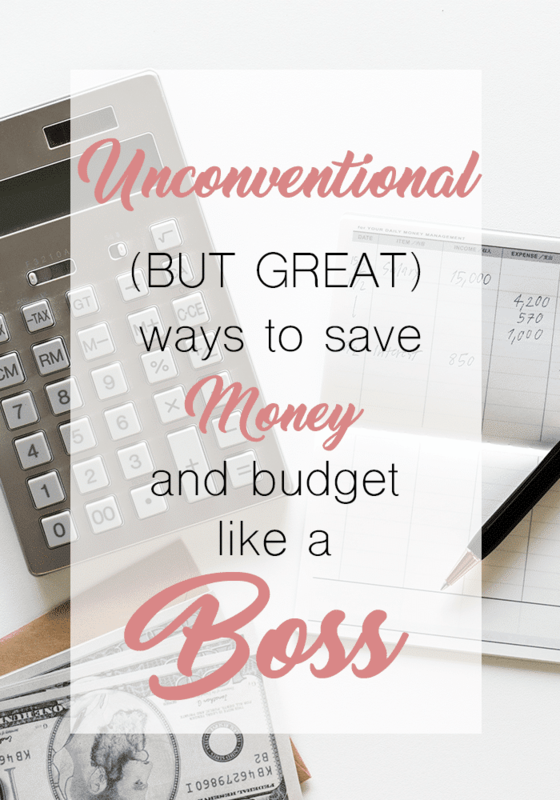 Looking to create a budget? Want to have emergency savings? Or do you want to pay off a debt? Start with this post. Whether you are trying to save for a big purchase like a home or trying to pay off student loans, budgeting your money can be difficult and seem overwhelming. You have bills that have to be paid, food that needs to be bought, and gas to put in your car. Trying to figure out how to manage all of that is stressful. Take it from me. My husband and I make enough money every month to pay our bills, buy our expenses, and still have money for little luxuries. But, we often find ourselves living paycheck to paycheck because in the past we have not budgeted our money. More than anything, we both want to buy a house. So, we know that we need to be saving for a down payment. But, when we haven’t taken the time to sit down and write out a budget and plan for that kind of large purchase, it’s unrealistic. That’s why I decided that we needed a budget and something that would hold us accountable. I know that the best way for me to do this is with my bullet journal. So, I took two full days to come up with pages that were beneficial for this purpose. These bullet journal budget pages were created to help make budgeting and financial planning easier and less stressful. The printable bullet journal budget pages below can be used time and time again and will help you better manage your money, debt, and savings goals. While most of the pages in this setup are fairly self-explanatory, I want to explain and show you how I use them most efficiently. But, you are free to use these in whatever way works best for you. On this page, you will write out three of your top financial goals and the timeframe in which you wish to accomplish them. Remember to set SMART goals. 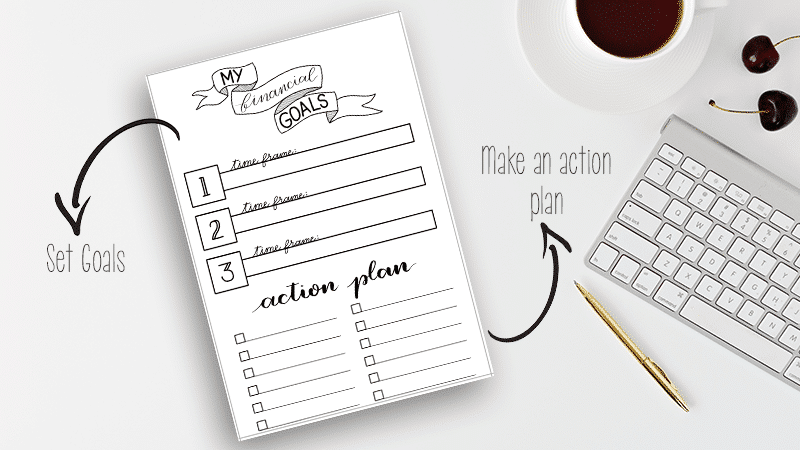 If you are unsure how to write out your goals efficiently, check out this post on Goal Setting Strategies. Some examples of SMART financial goals might be: pay of Chase credit card by Christmas this year or have $1000 in our joint savings account by June 2019. You can set both short and long-term goals on this page as long as you specify your timeframe. Maybe you want to have two separate goal pages; one is for monthly goals, and one is for annual financial goals. Spend less than $100 eating out or ordering food this month. Below the area where you will write in your actual goals is a place to fill out your action plan. This section is equally important. Here you will write in the steps you need to take to achieve your goals. For instance, if you wanted to save $1000 in 10 months, you would need to be saving $100 per month. Further, break that down by paycheck to figure out how much you should be saving out of each paycheck. Writing down your goals plays a huge role in helping you accomplish them. According to this Forbes article, a process known as encoding happens when you write down your goals. In short, this means that you are more likely to remember your goals. On top of that, when you write down your goals, you can easily reference them. Whether you are setting financial goals, fitness goals, or work-related goals, you should be writing them down and looking at them often. This page is your standard budget planner page. It has space for each of your monthly bills, along with the due date, if your bill is on auto-pay, and a place to mark off when the said bill has been paid. There is enough room on this template for 17 different monthly bills. If you needed more room, you could recreate this spread without the spending log at the bottom. Off to the righthand side of the page, there is space for your beginning and ending monthly balances of both your checking and savings accounts. 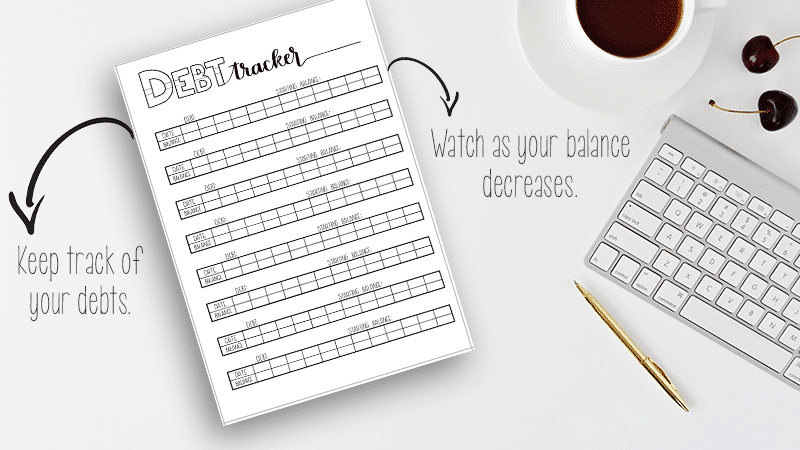 Fill out the beginning balances on the first of the month and the ending balances on the last day of the month. Along with the bill tracker and balances, I have also included space for payday information and extra necessary expenses like gas, food, school-related expenses, etc. Below the bills and expenses section is the beginning of the spending log. For this, I included space to write in the date, the purchase/place of purchase, the amount spent, and what purchase method was used. If you have multiple credit cards, you might want to give each a nickname – Chase, Disc., Cap1, etc. As you get older, it seems like you acquire more and more bills. Some of them are on auto-pay and are withdrawn from your bank account on the same day every month. Others you have to remember to pay by the due date. This setup will help you keep your incoming and outgoing money organized so that you aren’t surprised by anything coming out of your bank account. It will also help you see how much money you are earning each month along with how much you are spending on bills. While this page is very busy, it will likely be your best financial companion. Depending on the month, you may need to adjust your expenses accordingly. This page allows you to do this and see the difference it makes. Because the spending log section on the monthly budget page isn’t very long, I wanted to add an additional page for you to use for your purchases. This page is an exact replica of the spending log on the monthly budget page. 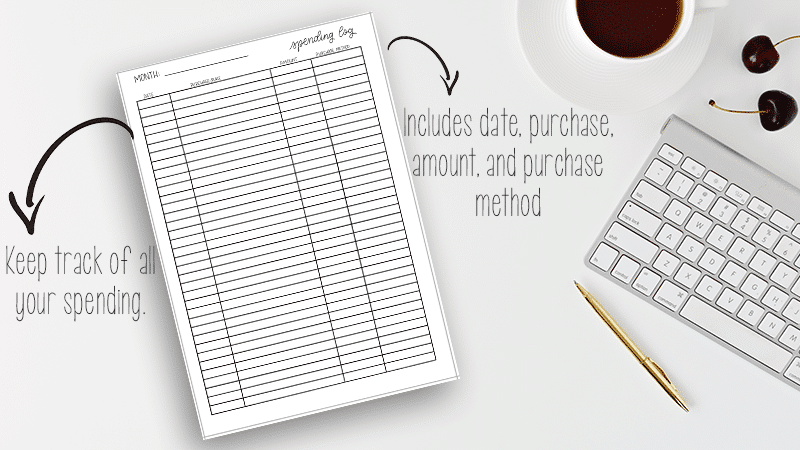 It includes space to write in the date, purchase and place, amount, and purchase method. If you find that you need more room, you can print this page out multiple times. This page alone has 36 rows for purchase records. Paired with the monthly budget page above, there are a total of 48 rows. Tip: Categorize your purchases and then color code them. For example: write all grocery related purchases in green and all activity/entertainment purchases in pink. This will help you analyze your spending habits. For my family, this has been one of the most beneficial pages. If you commit yourself to write down every single purchase you make throughout the month, you can look back and see where you can cut back. Often times, we stop at the convenient store and pick up snacks and drinks without thinking about it. Or maybe you are getting coffee five times a week and spending roughly $20 per week on coffee. If you are looking to cut back, you can evaluate these purchases to find out which are necessary and which are small luxuries that can be cut out or cut back. Keeping up with this page can be very demanding. But if you are serious about taking control of your finances, it’s one of the best ways to start. According to a recent article on USA Today, 8 out of 10 Americans are in debt of some kind. Whether it’s credit cards, a car payment, or medical bills, it’s important to stay up to date on these debts. Knocking down your credit card debt or medical bills can improve your credit score, allowing you to qualify for better interest rates on loans. This page can help you see your progress on debt and keep you accountable on your payments. There is space for eight debts where you can keep track of the debtor and your ongoing balance. The best way to use this bullet journal budget page is to fill in the debtor along with your current balance. Then, along the top row fill in the upcoming due dates. This will keep you accountable for your payments. Then, each month, fill in your balance and watch as the number decreases over time. If you are like most American adults, you likely have multiple debts. And most of them probably have different due dates. This page allows you to keep track of all of your debt in one place. It can also be very motivating to actually see your balance decreasing each month, meaning you may rethink spending money on your credit card. Or you might decide to pay a little extra on your car payment this month. Meal planning isn’t just for people who are trying to accomplish fitness goals. It’s also a great way to cut down on your grocery expenses. Meal planning can help you avoid rushing to the nearest fast food joint or ordering a delivery pizza because you didn’t get t the grocery store or dethaw anything from the freezer. This page has rows for each day of the week, along with a line along the top to fill in the current week. Each day is broken down into your actual meal plan and a mini grocery list. Then, you can estimate the cost of each meal based on the groceries you need to buy. Tip: Keep past weekly meal planner pages to give you ideas for upcoming weeks. 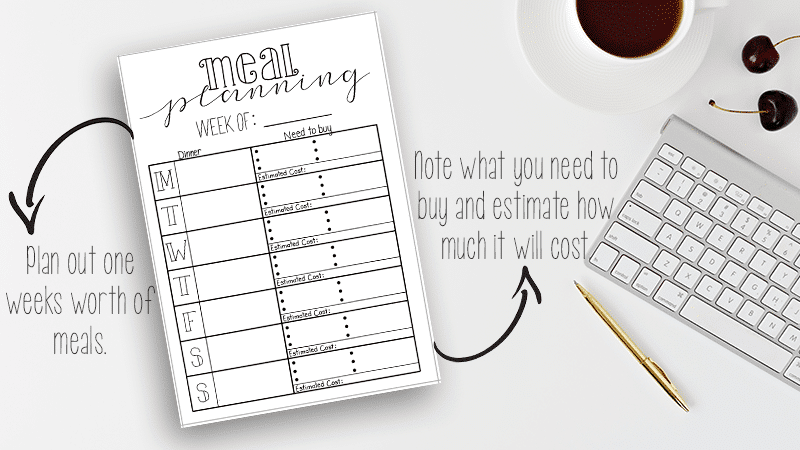 After a while, you will be able to throw together a budget-friendly weekly meal plan in just a few minutes each week. Meal planning can cut down your grocery bill each month and can help you avoid spontaneous nights of eating out or ordering in. Also, meal planning can help cut down on produce waste because you are planning out what ingredients you will need in advance, instead of guessing while at the grocery store. I love a good catchall page. In the past, I have done this for health and fitness, but I don’t know why I never thought to do it for keeping track of finances. This page is set up like a standard monthly calendar. You can fill it in for any month with the specific days and dates. From there, you can customize it with a number of icons and small, brief notes. At the bottom of the page, there are a number of icons you can use to keep up on your finances. 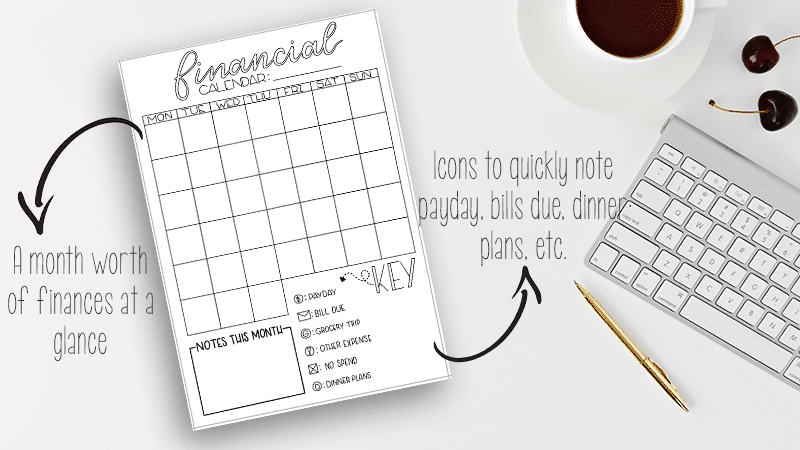 These icons include payday, bill due, grocery trip, other expense, no spend, and dinner plans. To use this page, fill it in at the beginning of each month with all of the information you know. For instance, fill in the days that you have bills due along with your paydays throughout the month. If you know of any atypical expenses like kids’ school trip, events, etc., you can also fill those in. From there you can start meal planning and planning grocery trips. You might do this bi-monthly, weekly, or just once at the beginning of the month. Find a routine that works best for you and your family. Unlike the weekly meal plan, this is a more zoomed out view where you can quickly jot down a month worth of dinner ideas. From there, you can break them down in the weekly meal planner to figure out needed groceries and estimated costs. This page acts as an overview of your entire month. With the icons, it’s easy to quickly scan and read. 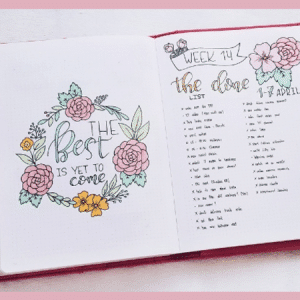 While most people include a weekly spread in their bullet journal, having something broader and less clustered can be very beneficial. You can plan for the weeks ahead, analyze your current financial situation, and prepare for upcoming expenses. I saw a similar savings tracker printable on Pinterest a while back and knew I had to recreate it. Saving $1000 is a big accomplishment if you don’t have much of a savings or your savings is non-existent. It can also seem like a big, unattainable number when you are on a budget. This page makes it seem less daunting. There are a total of 88 boxes with realistic money amounts inside. If you add up all the boxes, the total is $1000. To use this page, start saving any extra little bit of money you have. If you put away $5, color in one of the $5 boxes. 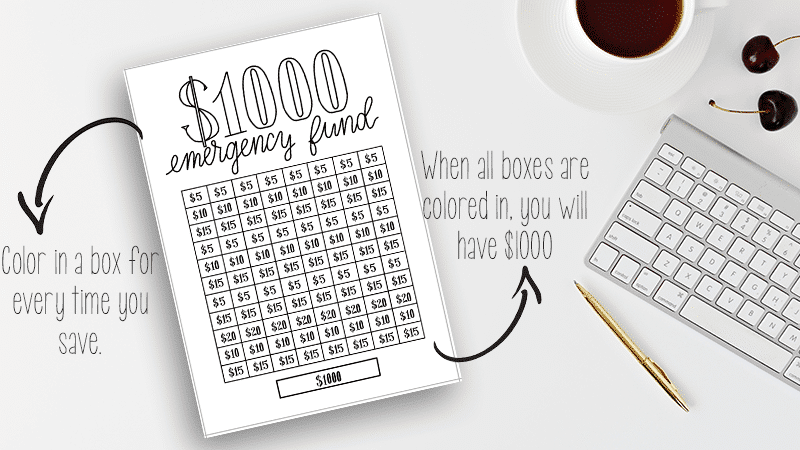 Once you have filled in all of the boxes, you will have $1000 saved. You can save in cash or deposit it in a savings account. Watching those boxes get filled in is motivational and will keep focused on your goal. Everyone should have an emergency fund in case of job loss, injury, illness, car problems, etc. You never know when you will need that extra bit of money. This page keeps you motivated to add to your savings and it makes the task of saving $1000 seem a lot less intimidating. All of the pages shown above are for sale in my shop as a bundle. 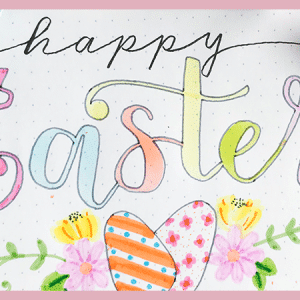 Head to this link to purchase the printable and see the full description of what you get. 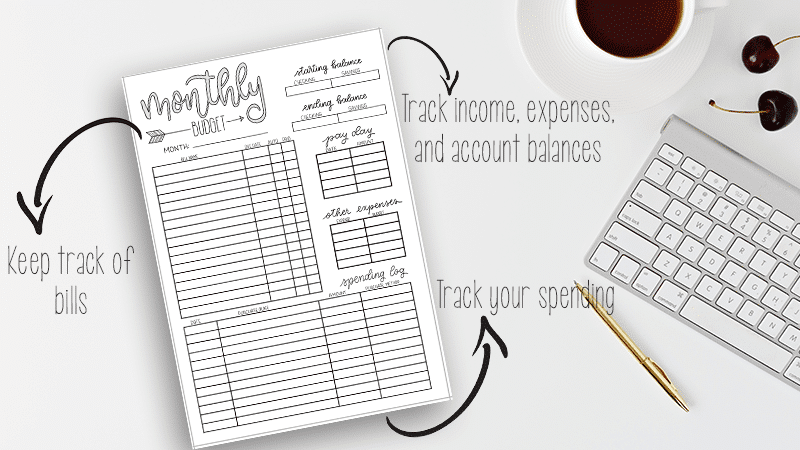 You can use these printable budget planning pages time and time again. And after you purchase them, you will have access to every page for as long as you keep the file. Or you can purchase this printable bundle of 7 budget planning pages right here. 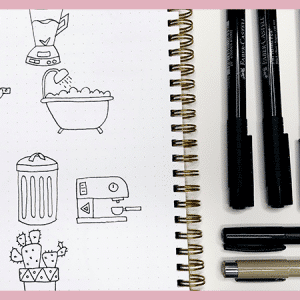 While these bullet journal budget pages will most definitely get you on the right track with your finances when used consistently, you may want to take extra steps to further better your financial situation. After years and years of living paycheck to paycheck, Chris and I finally broke down and decided to make some changes. These are the actions that have helped us get on the right tracker. For more inspiration, check out this post on Financial Planning in Your Bullet Journal. I am a notorious spontaneous shopper. If I walk into Target for milk, I usually come out with a fuzzy blanket, a coffee cup, a cute top, and no milk. I don’t even think of the money I’m spending on things that aren’t necessary. I knew that I had to take control of my poor spending habits. A no spend tracker in my habit tracker wasn’t working. But, I also knew that I didn’t want to deprive myself of all the little luxuries. So, we evaluated our finances and decided on a realistic weekly allowance for each of us. This allowance goes towards things that are not necessary. Food, gas, and household supplies are excluded. However, this allowance applies to things like eating out, coffee, energy drinks, etc. So, if Chris and I want to go out to eat, we both have to agree to use a portion of our allowances for that purpose. Everyone will have a different number when doing this. Come up with a realistic number for you and your family that allows you to enjoy the little extra things, but not break the bank or put you in financial stress. I downloaded and started using Acorns roughly 9 months ago and have saved over $800 in that timeframe. Acorns is an automatic savings app you can put on your phone. It’s 100% secure and it will literally save your extra pennies for you. All you have to do is link your debit card to the app. After that, every time you use your debit card, Acorns will round your purchases up to the nearest dollar and invest those extra pennies. It offers various levels of investment that will influence how much interest you make. Over the past 9 months, with my account set to aggressive, I have earned $17 in interest on just $800. That is better than any savings account at a bank. And the biggest benefit is that you don’t even have to think about it. It does it all by itself and you can just log in here and there to check your balance. Whether you want to start an emergency fund, start saving to buy a house, or just want some extra money when Christmas time rolls around, Acorns is a great way to save money without any effort. If you want to sign up, you can use my link here. Once you link your card and make your first deposit, you will get an additional $5 in your account for being referred. I get $5 too, so it’s mutually beneficial. For as long as I’ve been spending money, I have always thrown away every receipt. Part of me didn’t want to know how much I was actually spending, and the other part just didn’t want the hassle of keeping track. But, keeping your receipts is beneficial for a couple of reasons. For one, it keeps you accountable for all of your spending. Even if you just ran to the convenient store for a snack, you keep your receipt. From there, you can analyze your spending and see what unnecessary purchases you are making. Secondly, it adds a bit of mindfulness to your spending. Every time you swipe your card or hand the clerk cash, you have to get a receipt. And you have to keep that receipt. After some time, you will start to really ask yourself whether or not you need to run to Target or not. I’m talking about literal freezing. Grab a small plastic storage container and fill it with water. Now, drop your credit cards inside, put the lid on, and put it in your freezer. The next step is to go to Amazon, eBay, or wherever you store your credit card information online and delete that info. This may seem a bit farfetched, but it works. Now, anytime you think you need or want something that you would buy on your credit card, you will have to think twice. Because if you really need to use your credit card, you will have to take it out of the freezer and dethaw the ice to use it. I would love to hear your thoughts on budgeting. What do you do to stay on top of your finances? Have you already incorporated budgeting into your bullet journal? Let me know in the comments below.